The latest crash test results of the #SaferCarsforIndia campaign, released by Global NCAP in Delhi on Monday, show that Nissan’s Datsun Go received a zero-star safety rating. The vehicle structure collapsed and was rated unstable during the test. The high forces placed on the crash test dummies pose a grave risk of death or serious injury. The Go’s body shell is so unstable that it would be pointless to include airbags in the car. Global NCAP Chairman Max Mosley has now written to Nissan Chairman and CEO, Carlos Ghosn, calling for an urgent withdrawal of the Datsun Go from the Indian and related markets. Max Mosley, Global NCAP Chairman said: “It is extremely disappointing that Nissan has authorised the launch of a brand new model that is so clearly sub-standard. As presently engineered the Datsun Go will certainly fail to pass the United Nation’s frontal impact regulation. In these circumstances I would urge Nissan to withdraw the Datsun Go from sale in India pending an urgent redesign of the car’s body-shell. “Applying the UN’s minimum crash test standards to all passenger car production worldwide is a key recommendation of the Global Plan for the UN Decade of Action for Road Safety. The DATSUN GO scored zero stars for adult occupant protection and just two stars for child occupant protection. The Datsun GO’s vehicle structure collapsed in the crash and was rated as unstable. The car’s lack of airbags meant that the driver’s head makes direct contact with the steering wheel and dashboard – the dummy readings indicate a high probability of life-threatening injuries. However the failure of the body shell makes it redundant to fit an airbag. 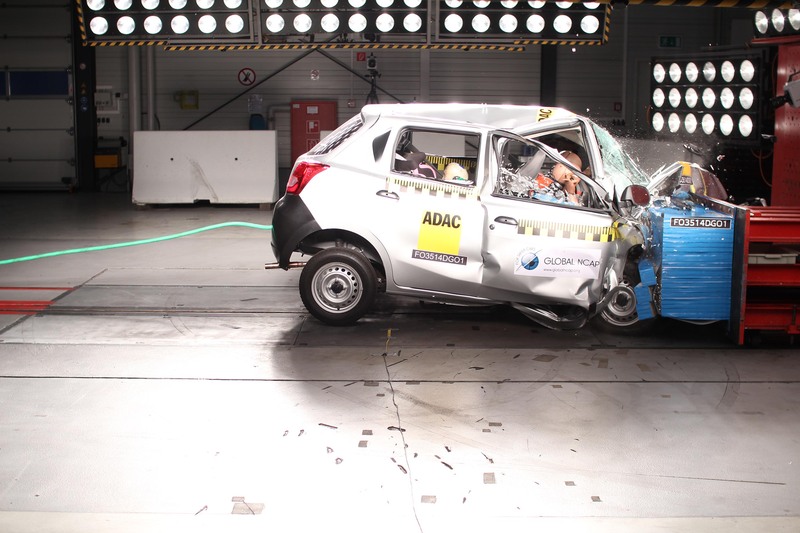 In January 2014, Global NCAP published crash test results for five of India’s best-known cars: the Suzuki Maruti Alto 800, the Hyundai i10, the Ford Figo, the Volkswagen Polo, and the Tata Nano. All the cars received zero-star adult protection ratings. Volkswagen has since decided to offer the Polo for sale in India with two airbags as standard. This model subsequently received a four-star safety rating. 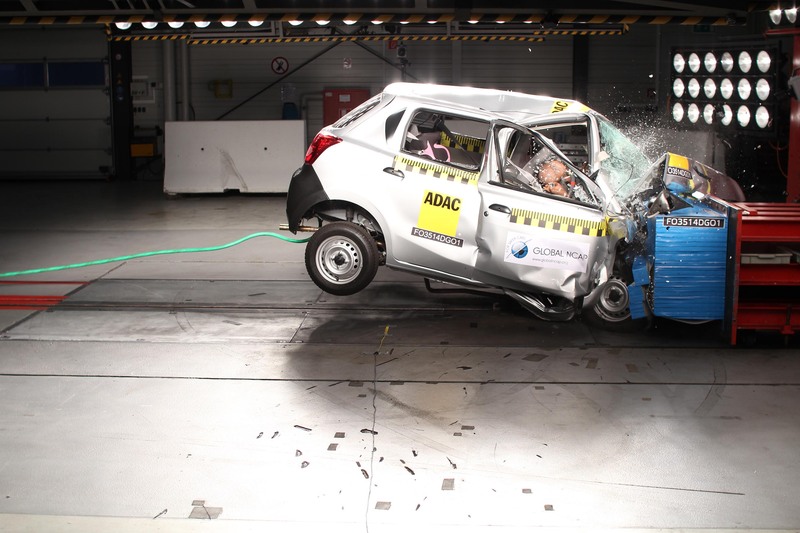 In November 2014, Global NCAP published crash test results for Nissan’s Datsun Go and the Suzuki Maruti Swift. Both cars received zero-star adult protection ratings.